Summer rolls are not difficult to make, but needed quite a bit of preparation work done. 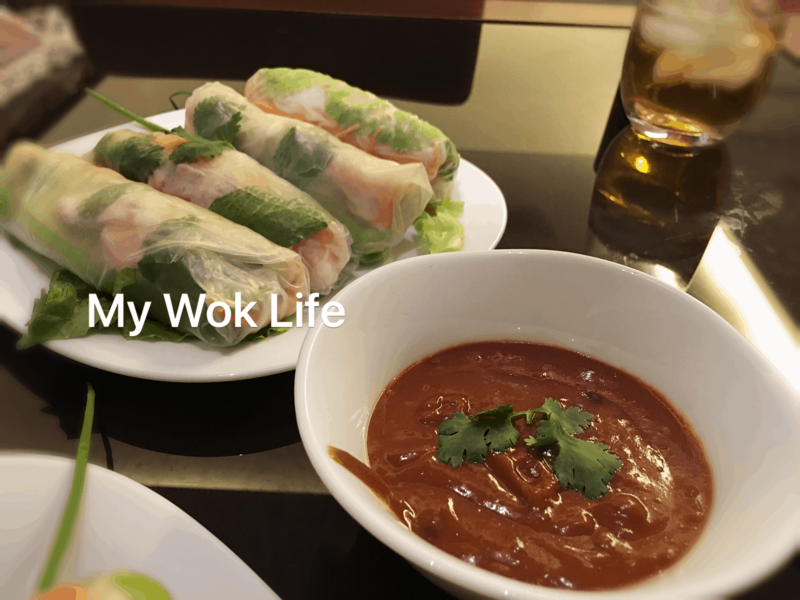 I wouldn’t mind, because I knew I would have the best spicy peanut sauce made by myself that I could adjust the taste best suited to my liking. You are right, the summer rolls would never complete without a nice dipping sauce. (1) To make dipping sauce: Combine all ingredients well in a bowl. Set aside. (2) To make summer rolls: Pre-boil soaked bee hoon till cooked. Drain, gently coat with drops of sesame oil, and set aside. Pre-boil prawns, half each lengthwise, devein and set aside. Pre-boil pork slices, drain and set aside. (3) To assemble summer rolls: Get all the ingredients ready in its bowl. Prepare a large deep plate of cooled water for steeping to soften the dried rice paper wrappers. (4) Get a piece of rice paper and steep it in the water for 8 seconds. Remove semi-softened rice paper and place it on a large sheet of clean damp cloth. 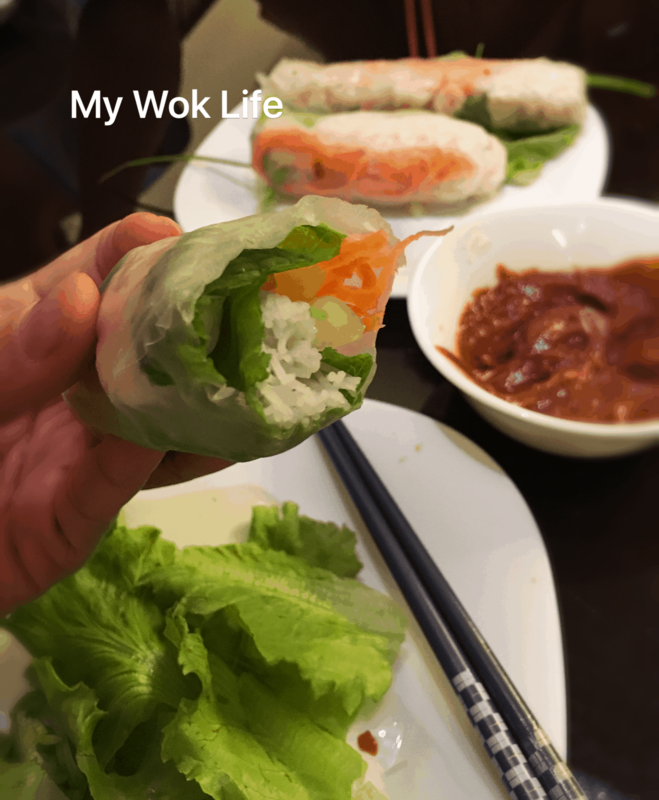 Place mint leaf and parsley leaf apart on softened rice paper. Place prawn halves (cut side up) and pork slice in a straight row with and between the leaves. 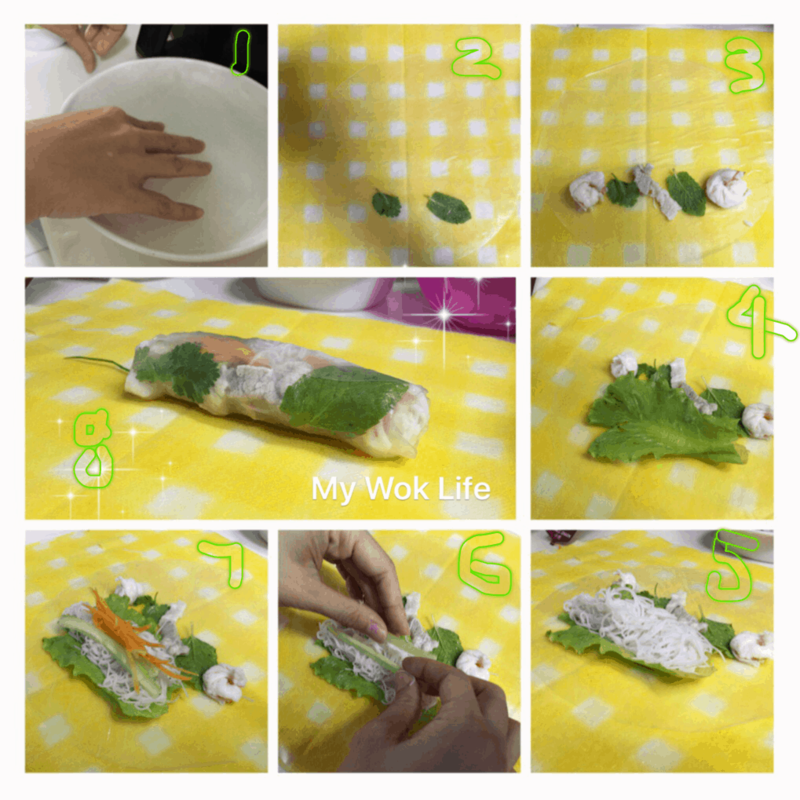 (5) Place a leaf of lettuce on the lower part of the rice paper. Top with bee hoon, followed by cucumbers and carrots. (6) Carefully fold the lower edge of rice paper over filling, and both sides. Place spring onion stalk and continue to roll the rice paper up to seal the edges. Put the ready roll on serving dish. Repeat steps until all the summer rolls are done. Garnish with sesame seeds. Serve with dipping sauce. A summer roll with spicy peanut sauce counts about 160kcal. Tips: Try to use thick bee hoon instead of the thin type. It’s with better mouthfeel of the summer rolls. * Do not over-steep the rice paper as it will be difficult to roll up later. 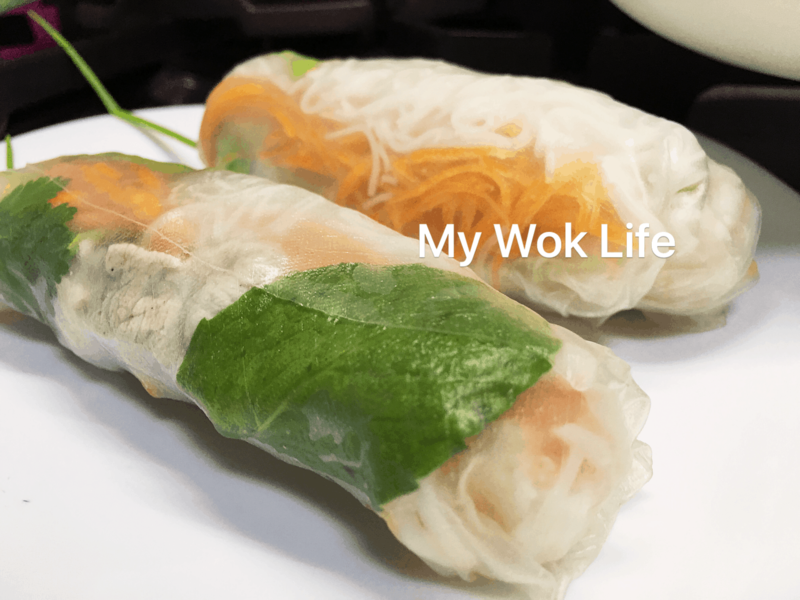 Not to worry that the rice paper isn’t soft enough when first taken away from the steeping water as it will continue soften on the damp cloth along the assembling process. * Rice paper wrappers are sold in dried hard pieces in a packet. It’s easily available at major supermarkets and some provision shops. * Omit Sriracha chili sauce, if non-spicy sauce preferred. Dear sis, your recipe is amazing.